woofing and scuffing at not quite a trot. hot to rot an open mind. Little bird, where have you come from? held. You stayed until I was sure. in the swirling hum, hovering heat with no hard lid. I notice grasses keep a strong shadow. I know I’m asked and spared nothing. The poem implies an ecopoetics that, to use Jonathan Bate’s words, ‘is not a description of dwelling with the earth, not a disengaged thinking about it, but an experiencing of it’ (The Song of the Earth, 42). The reduced human agency allows the spirit of place to be embodied in the images that yoke together the visible and invisible, the earthly and unearthly, and the human and natural. When it engages with the quotidian and with what is at hand, Beast Language evinces Davidson’s ability to convey a beauty stripped bare of ornament. There are tender poems too, of birth (‘Three Months Old’) and death (‘Bar-do’); but one wishes for more sustained human engagement, and for the poet to sustain narrative and descriptive accounts of the here and now or of memory, rather than cast his gaze outwards to galactic and postmodern tropes, as he does in ‘Two Brickettes on the Subject of Ultraviolence’ and poems inspired by computer games. There is a vagueness of imagery not just in these poems but elsewhere in the collection (‘Master of Stomachs, our powers have greyed/ absorbed for congruent, apparent eternity’). There are also instances of awkward syntax (Blushing girls return like stone fruit,/ breeze at the knees flicks a dress), and slack and lazy diction (‘It is beautiful’). Perhaps Davidson’s reach is over-extended, and the collection’s ambitious structure and range are inadequately supported by the substance of individual poems. The key sequence ‘Religion: Road’ lacks an overall coherence; it should have given the collection a thematic and imagistic focus but loses its way among diffuse references. Its flaws notwithstanding, Beast Language announces a new voice and way of seeing in Australian poetry, and offers moments of vivid insight into place and self on the journey from the western seaboard to the Pacific coast of the continent. 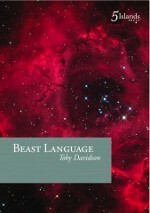 This entry was posted in BOOK REVIEWS and tagged Kim Cheng Boey, Toby Davidson. Bookmark the permalink. Kim Cheng Boey has published five collections of poetry and a travel memoir entitled Between Stations. He taught at the University of Newcastle for thirteen years before joining Nanyang Technological University in 2016.